On Friday, the Centers for Disease Control and Prevention provided the latest updates on how this winter’s flu season is continuing to shape up. And much like anything else these days, it’s a pile of gloom and doom. The flu killed at least another 16 children this past week, bringing the current tally of pediatric deaths to 53. Flu activity has now reached a high level in 42 states, up from 39 the previous week. And a record-breaking number of people are ending up in the hospital. “Hospitalizations are now the highest we’ve seen,” CDC Acting Director Dr. Anne Schuchat said during the briefing. 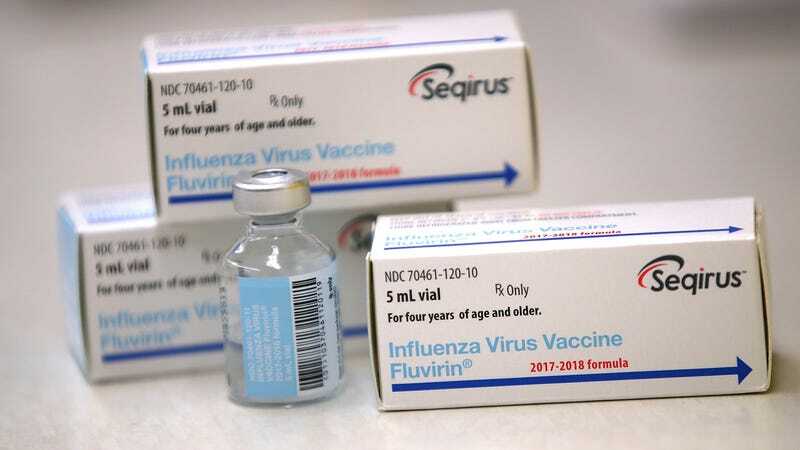 Schuchat elaborated that the total rate of flu-related hospitalizations so far has now eclipsed the rate seen at the same point during the 2014-15 flu season, which was the most severe flu season in recent history. Most of these hospitalizations, as is typical for the seasonal flu, involve the elderly. Meanwhile, outpatient visits have also outpaced every year since 2009—when a literal flu pandemic battered the country twice in one year. One of every 14 visits to a doctor this past week was sparked by flu-like symptoms. There are some bright spots. Parts of the West have seen lower flu activity, indicating the worst might be over for them. Oregon in particular was the first state to have its geographic level of activity downgraded from “widespread” since the beginning of the year (Hawaii has been at a lower level this entire season, but the flu’s peak there often lags behind the rest of the U.S. by a month or two). That said, it’s almost certain that the flu season hasn’t yet reached its peak in most of the country. New York, for instance, saw more flu-related hospitalizations and cases reported this past week since the state’s current flu surveillance program was established in 2004. “We aren’t out of the woods yet, but there are steps everyone can take to fight the flu,” Shuchat said. These steps, I will haplessly shout into the void until sweet merciful death claims me, include getting your flu shot. Get it!